About 280 IAM District 751 members at AIM Aerospace in Sumner, WA have ratified their first union contract with a 75 percent yes vote. IAM District 751 members at AIM Aerospace in Sumner, WA have won 5.6 percent average wage increases plus improved benefits with their first union contract. 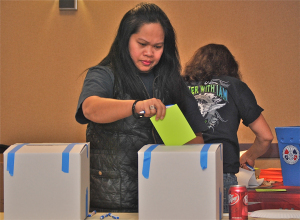 The workers ratified the contract with a 75 percent yes vote. The new four-year collective bargaining agreement covers some 280 workers at AIM Aerospace’s Sumner plant. The workers are composites manufacturing specialists who fabricate air ducts and other aircraft components used in Boeing and Airbus jets. The AIM workers voted in July 2013 to join District 751. Contract talks had been underway since September. The new contract, which is now in effect, guarantees that all Machinists at AIM-Sumner will get immediate wage increases of at least 3.5 percent. Machinists with four or more years with the company will receive annual increases of 2.75 percent in the deal’s second, third and fourth years. Those with less than four years will receive guaranteed wage increases based on tenure. In addition, the contract addresses one of the workers’ biggest issues going into the talks: the fact that most of them had been passed over for pay increases they’d been due under the company’s pre-union pay schedule. Under the terms of the agreement, AIM management is correcting that, and as a result, average hourly pay across the plant is going up 5.6 percent, with about a quarter of the workers receiving raises between $1 and $2.10 an hour. In addition to the raises, the Machinists at AIM will receive $325 ratification bonuses, and the company and union agreed to sit down within nine months to work out details of a new incentive pay plan. Along with the pay considerations, the new collective bargaining agreement ensures workers can’t be fired arbitrarily, and establishes both grievance procedures and formal job descriptions; puts limits on the number of temporary workers the company can use, and limits the amount of time new workers spend on probation; sets rules for assigning overtime; and puts limits on current health insurance costs and gives workers the option to buy additional coverage for themselves or their families.